Home • News & Events • News • RAMW Blog • Feast on Father’s Day at Texas de Brazil! 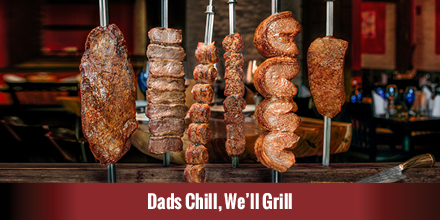 Feast on Father’s Day at Texas de Brazil! Texas de Brazil will be opening early at 11AM on Sunday, June 17 and serving their dinner menu all day. Plus, all fathers dining at the Brazilian-American Steakhouse will receive a $20 gift certificate to use on a later date. Here, traditions of Brazilian cooking blend with Texas hospitality to create a lively atmosphere in an upscale setting. Your meal begins with a visit to their extravagant salad area – a feast for your eyes as well as your palate. Indulge in a wide array of seasonal roasted vegetables, fresh artisan breads, charcuterie, imported cheeses and other specialties. Then enjoy the rodizio-style dining that has made Texas de Brazil famous. An endless parade of gaucho servers visits your table with skewers of freshly grilled meats carved directly onto your plate. Choose from succulent beef, lamb, pork, chicken and Brazilian sausage, cooked over a wood charcoal fire the way cowboys of Southern Brazil have prepared it for generations. It’s all served with authentic side dishes of garlic mashed potatoes, Brazilian cheese bread and sweet fried bananas. To complement your meal, select from an award-winning collection of wines or traditional Brazilian bar creations. And don’t forget to treat yourself to one of their decadent à la carte desserts. Serving weekend lunch Saturday – Sunday and dinner nightly. Happy Hour specials Monday- Friday, 4:30 – 6:00PM, starting at only $3. Texas de Brazil Washington DC is located at 455 Massachusetts Avenue, Northwest Suite 100, Washington, DC 20001. Learn more. Want to give Dad the gift of Churrasco instead? Purchase a Texas de Brazil dining card.